Antiseptic: Curcumin found in turmeric has got anti-bacterial, anti-viral, and anti-fungal properties. Studies suggest that regular application of turmeric on skin can cure and prevent common skin infections like ringworm, herpes, and staphylococci infections which cause boils and blisters. Exfoliating and moisturizing: Curcuminoids found in turmeric oils are excellent exfoliants. These turmeric constituents remove the dry and scaly tissues from skin, penetrate in the deepest layers and smoothens the skin. Brightening: Melanin is produced by the skin to protect it from the UV rays. However, excessive production of melanin makes the skin dark and dull. Curcuminoids has got potent anti-melanin activity and therefore application of turmeric brightens the skin over the time. Anti-seborrheic : Volatile oils found in turmeric are anti-seborrheic which means that they reduces the production of oils by the glands present below the skin. 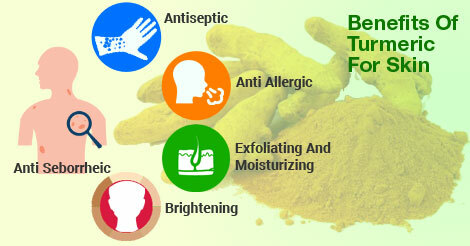 This property of turmeric can be very helpful for people with oily skin for whom pimples is a common problem. Anti-allergic: When an allergen comes in contact with sensitive skin it initiates inflammatory cascade and thus may lead to allergies conditions like dermatitis, Psoriasis, pruritus, itching and hives. Curcumin in the turmeric has been established to have potent anti-inflammatory actions which can prevent such skin allergies. Anti-tumor: Recent studies suggest that treatment with curcuminoids found in turmeric can help in curing and preventing cancerous tumors by virtue of their anti-oxidant properties. However, establishment of this statement requires further extensive studies.